When I bought a cookbook on Argentinian cuisine, finding a recipe for Welsh teacakes was a rather unexpected surprise. As it turns out, the southern coast of Argentina is home to a Welsh settlement that began in 1865. They settled in remote Patagonia, along the Chubut River. Today the Welsh-Argentinian population is around 20,000, but only some 1,500 speak Welsh. Well, I had the ingredients, the recipe looked simple, and I was intrigued by a recipe that used a whole teaspoon of nutmeg, so I made them late one night. Oh, yum! Traditionally, these teacakes are cooked on a flat iron plate hung over a peat fire. We don't have that setup (and if any of you do, post pictures!) but a seasoned cast-iron pan on a gas range works just as well. In fact, though the recipe says to oil the griddle or skillet, I found that unnecessary to do in my cast iron pan. Gather dough together into a ball and roll it out on a floured surface until about 1/4 inch thick. Cut into two-inch rounds with cookie cutter or glass. Head griddle until very hot. Cook teacakes on one side until brown, turn and cook on the other side until brown. Serve warm. Serving suggestion: serve with clotted cream or butter and jam. I thought for certain I would be lost when I walked into everyday cook for Francis Glorie's & Steve Rosoff's first class about French cuisine taught en français. In fact, my tongue froze up completely when Francis greeted me in French and I could only stammer an apology — in French — that I didn't speak French very well. You don't need to speak French very well to have a lot of fun cooking and learning about French cuisine with Francis and Steve, but you do need to be able to understand enough spoken French to follow along and get the gist of what they are saying. If you can do that, though, you'll have a very enjoyable time cooking along side of these two guys as they talk you through the preparation of several courses while, at the same time, helping you brush up on your French culinary terms. Francis is a private French chef and business executive. 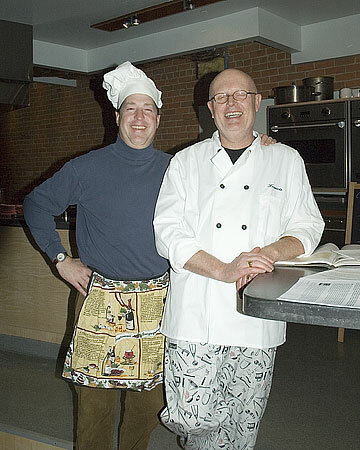 Steve teaches French at U of M and is a restaurant consultant and experienced cook. Over the course of the evening, they shared their love of food and French language and culture while showing how to prepare several amuses bouches. We kicked off the evening with a short lecture on the history of French cuisine and some of the main characteristics of French cuisine from different regions (e.g. butter is heavily used in the North, duck fat in the Southwest, and olive oil in the South). Then we got cooking. After they show you what they want, they hand you a knife (or other implement of destruction...) and ask you to finish it. I'm fine with a knife, but a danger around a stove. Sure enough, after Steve handed me a ladle for the blini I managed to graze my wrist against the hot handle of the large griddle (and consequently spill my ladle contents in a messy blob). As burns go, it barely even turned pink. And the side benefit was getting to eat the blini mistake as a test subject. And then there was the pâte aux choux... I got an arm workout incorporating eggs one at a time into the base until a soft elastic dough was produced. Once the pâte aux choux was ready, we stirred in grated gruyère, then dropped it in large spoonfuls on a baking tray, topped with a touch more gruyère, and baked until they rose into airy puffs. While I worked on these, my fellow student cleaned mussels and chopped confit de canard for a potato-duck appetizer. I've never cooked mussels at home before, but watching Francis steam them and then build the sauce showed just how quick and easy it was to make a bowl full of delicious mussels (with enough sauce left over for mopping up with bread!). The menu for the first class (alas, I did not write it down! so it's all by memory) included: gougère (gruyère puffs); frisée salad with bacon and goat cheese and a lovely dijon vinaigrette; little potato halves topped with duck confit; mini buckwheat blini topped with smoked salmon, a savory herb-flavored whipped cream, and salmon caviar; and mussels in a mild curry-white wine-cream sauce. I highly recommend this, even — perhaps even more so — if you think your French is not all it should be. I strongly believe that the best way to improve your foreign language skills is jump into an immersive experience that pushes you to learn. It's hard to find immersive experiences locally, and this comes fairly close to being immersive. And what better way is there to improve your French (at least your listening skills) than to spend a fun evening, with delightful company, learning about French cuisine? Space is limited and pre-registration is required, so call to reserve. Breaking News... Ann Arbor has a new European grocery! And they do have paczki. And the paczki are the real deal. And they have a whole lot more. Pierogi, breads, Polish meats (a truly dizzying array of Polish meats), canned goods, sweets... the place isn't huge, but the shelves are well-stocked. And, as it happens, Tuesday was their first day open. We went back Wednesday for pictures and to try some bread and sausages. The meats are made by a Polish butcher (as in, by people who came over from Poland themselves) in Chicago. 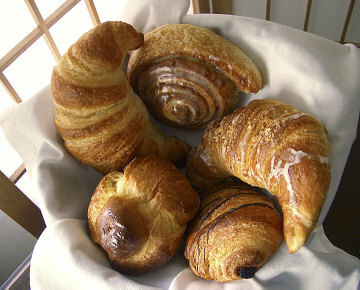 The pazcki and some of the other pastries come from Hamtramck. Chajec and Magiera bake their own bread from dinner rolls to multi-grain loaves on premises. Click on the photo to see a larger image. In addition to a paczek, we tried a bread stuffed with a poppy seed filling (yum), an egg bread (also yum), and some small ciabatta bread rolls made on the premises (very nice, especially with butter). They are still experimenting with what breads their customers like best, and they're considering adding Russian black bread. Joe sampled a number of the sausages and meats. They're good, and different from what you usually see around. He says more exploration is required. The shelves are stocked with tinned fish and meats, pickled vegetables, seasonings and spices, pasta, and Polish chocolates and candies. Click on the photo to see a larger image. We picked up some pierogis, stuffed cabbage rolls, and a bottle of pickled vegetables as a side salad and had a quick Polish dinner. We'll do Copernicus in more detail once they've been open for a while, but we had to let you know! I used to dislike eggplant for no other reason that as a kid I thought it was one of those foods one was supposed to dislike. Maybe I have a bad eggplant experience hiding in my past that I can't remember. That's okay — I feel no need to recover any such childhood memories of horror. But I do remember the first eggplant dish I fell in love with. We were dining with friends at a Chinese restaurant in Pittsburgh some years back, and they insisted that we try the eggplant with pork. Slices of eggplant were split to make a pocket with a bit of ground pork stuffed inside and stir-fried with, if I remember right, black bean sauce. It was the dish that made me realize that eggplant was not the great dark evil fruit of yuckiness. It is a dish I still dream about. In spite of that revelation, I did not start cooking eggplant myself until this year, when eggplant came as a part of our CSA farm share from Tantré Farms. Like many previously not-used-in-this-house-vegetables, it was cook it or lose it. But I had a challenge to overcome: find eggplant dishes that even Joe would like. It was something of a struggle. He has long voiced his dislike of eggplant. Fortunately for me, he'll try anything I cook at least once, and when I saw I was cooking eggplant tonight he said that he would taste it but, "Don't ask me to try brussel sprouts." When the eggplant was done, I asked him how he liked it. "It's pretty good," he said. Yippie, I thought. That's sky-high praise for a normally despised food. "Mostly because I couldn't taste the eggplant," he added. And dressed with honey, mint, and toasted sesame seeds. Kinda hard to go wrong with that combination. Soak eggplant in 2 cups water with 1 tsp of the salt for 30 minutes. Scatter sesame seeds on a tray and lightly roast for 5-8 minutes. (In truth, I skipped the oven bit and did this very quickly in a pan on the stove top, but you have to stir and watch the seeds constantly or they will burn.) Set aside. Drain eggplant and dry well on paper towels. In a small bowl mix together the flour, remaining 1/8 tsp salt, and baking power. Whisk in the milk and egg. Pour the oil into a large skillet to a depth of at least 1/2 inch and heat until it quickly browns a cube of bread (approx. 375 F). 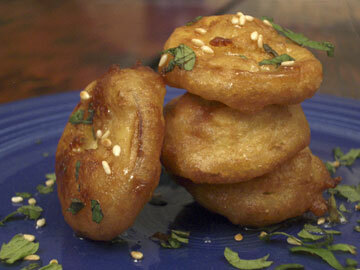 Dip eggplant slices in batter, coating well, then place immediately in the oil. Cook for about 30 seconds on each side. Drain on paper towels. Warm honey in a small saucepan or in a microwave. Drizzle lightly over the eggplant, sprinkle with the sesame seeds and mint. Serve right away. I used long narrow Asian eggplants with thin skins, and so I didn't peel them. I think I would do this with larger eggplants in the future mainly because it will be easier to batter and fry larger slices. With so many coin-sized slices, getting them all battered and into the oil without clumping took a bit of time. Hake fish cooked in a tomato-onion-lemon juice sauce served over wilted spinach. This tasty Greek recipe comes from one-pot, slow-pot, & clay-pot cooking. It requires a fair number of ingredients, but it's actually simple to make. I added the spinach. 1) Heat oil in heavy saute pan. Add onions and cook, stirring until pale golden. Add tomatoes, garlic, sugar, dill, mint, celery leaves, parsley, and water. Season with salt and pepper. Simmer uncovered for 25 minutes, or until liquid has reduced by 1/3. 2) Add the fish and cook gentley for 10-12 minutes until the fish is just cooked. Remove the pan from the heat and add the lemon juice. Cover and leave to stand for 20 minutes. Arrange fish on a plate and pour sauce over it. Garnish with herbs. 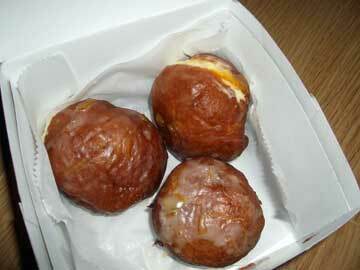 Three delectable paczki from Amadeus restaurant in Ann Arbor. I love the use of thyme in this soup. My note in the recipe margine says "careful with the potatoes — not too many, maybe more tomato". The recipe serves six, which means I'm sizing it down for two, so I probably mis-measured the first time. I was also a bit light with the potatoes, and the soup didn't thicken as much even with the cornstarch (but I like it this way). Here's the original recipe. I think it's a bit light on the spices. I have also used diluted chicken stock when I didn't have any vegetable stock. 1) Heat oil in large, heavy pan. Add onion, garlic, potatoes, and paprika and cook, stirring occasionally for about 5 minutes or until the onions have softened but not browned. 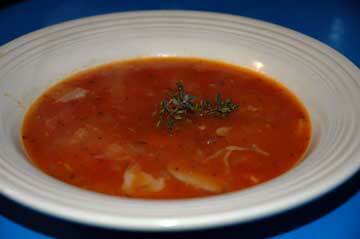 2) Add chopped tomatoes, thyme, and vegetable stock. Simmer for 15-20 minutes until the potatoes are cooked through. 3) In small bowl, mix cornstarch and a little water to make a paste. Stir it into the soup. Boil for about 5 minutes until the soup has thickened. 4) Use a wooden spoon to break up the potatoes slightly, then season to taste. Garnish with extra thyme. Joe's parents gave us a large clay pot, and I never knew how to use it until I got this cookbook . It has a nice variety of recipes spanning several cuisines. Though the name's a bit misleading as you'll often need more than one pot to put together a complete dinner.